Last Monday, January 22, the Supreme Court of New York State rendered a judgement in the case of Mohamed Albanna, city councilman-elect and convicted felon. In a long-awaited decision, the court ruled that Albanna, who, in 2006, pleaded guilty to the federal crime of operating an unlicensed money transmitting business, is thus "ineligible to assume the office of 1st Ward Councilman in the City of Lackawanna." In 2002, the New York Times profiled Albanna, a prominent businessman in the Lackawanna, NY Yemeni-American community. He, along with two of his relatives, had just been arrested and indicted for illegally sending hundreds of thousands of dollars to Yemen. Albanna, incidentally, also served as vice president of the American Muslim Council of Western New York--an Islamist organization whose president, Dr. Khalid Qazi, has a long history of "Islamic extremist activity, including raising money for an Al Qaeda charity and serving as a director of a Pakistani intelligence operation aimed at buying influence with American politicians." Albanna's nephew, Jaber Elbaneh, was identified as "uncharged co-conspirator B" in another Buffalo-area case--that of the Lackawanna Six-- wherein six young men were charged with forming a terrorist cell. The Washington Post noted that Albanna had emerged as "one of the most visible community advocates for the young defendants. [He] described the suspects as family men who played soccer and were between jobs." 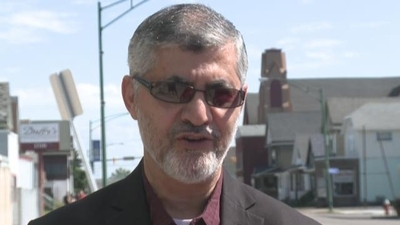 According to a 2006 article in The Buffalo News, U.S. Attorney Terrence P. Flynn said that, "In early 2002, Lackawanna Six member Yahya Goba used Albanna's hawala [an illegal, unlicensed money-transmitting company] to send money to Kamal Derwish, an alleged recruiter for the al-Qaida terrorist network, in Yemen." "Authorities have never alleged that any of the money was used for terrorist purposes" but Flynn said that, "because no proper records were kept, authorities have no way of knowing." Albanna's familial connections to terrorism notwithstanding, he was sentenced to five years in prison and three years of probation for sending more than $3 million to Yemen. Federal investigators were unable to prove that Albanna sent money directly to Yemeni terror cells. Though Albanna's city council opponent, John Ingram, challenged the legality of Albanna's bid for the office during the campaign, Albanna's attorneys initially managed to show that the charge of a crime involving "moral turpitude" didn't apply to Albanna's felony. He was thus allowed to run for the city council post, and won the seat. Finally, in an appeal brought by the Lackawanna City mayor, the Supreme Court of New York ruled that Albanna's conviction did, in fact, involve moral turpitude. Albanna admitted to having "operated an illegal money transmitting business that transmitted more than $3.5 million to Yemen over a 13½-month period; transmitted money to Yemen from individuals who did not fully and accurately identify themselves; transmitted money to Yemen without inquiring about the source of the money or why it was being sent; made false entries in a money transfer ledger to hide the identities of certain senders and recipients; failed to file required currency transaction reports for cash transactions in excess of $10,000; and knew that his business did not have the required license to transmit money."